Roger Dean Stadium, Jupiter, FL.Nov. 16, 2013 – One of Martin White’s last moves before the start of the MSBL Fall Classic was to add one more guy to the roster — and now he looks like a genius. That’s because that late addition, Greg Schaefer, added to the club just 10 days before the tournament, capped a scorching offensive week with two singles and two RBI as the DW Energy Group Giants beat the battle-tested East Coast Cardinals3-1 to claim the 35 National Division title at the spring training home of the National League Champion St. Louis Cardinals and the Miami Marlins. The Dallas-based team added Schaefer to fill a defensive hole, but ultimately it was the Atlanta native’s bat that lifted his manager and teammates and earned him a tournament Most Valuable Player award. “Greg was our leading hitter all week, batting around .750, so I’m not surprised he came through for us today” said White. For White, it’s his ninth ring in MSBL play, some as a player, and some as both a player/manager. But for Schaefer it’s his first MSBL title. “I was fortunate to be part of the Kennesaw State team that won the N.A.I.A. championship back in ’94, but this was totally unexpected” said Schaefer. The Giants won despite being outhit 12-5. The Cards had runners on base every inning, but they stranded 14 of those runners. The Giants may have finished with a perfect 7-0, but almost didn’t reach the championship. After getting great pitching all week, and holding opponents to four runs or less in every round-robin contest, they found themselves trailing by four runs in the semi-finals against the Southern Maryland Rodeo. With help from third baseman Travis Hitzeman, who banged a three-run homer, they climbed out of that hole. Hitzeman, who looks and plays like a major leaguer, missed the start of the tournament as he was back in Texas filming his part in the movie “Dallas”. In winning the semifinal, the Giants had to use the pitcher they were saving for the title game in the process. “We were hoping to save (Chris) Cumberland for the championship, but had to use him for the final three innings Friday to give us a chance to win that one” said White. It truly was a team effort by the Giants, as Cumberland did pitch again in the championship. He relieved starter Dave Schenck in the fifth, and allowed the Cardinals their only run as they collected four hits in the inning, three coming after two outs. 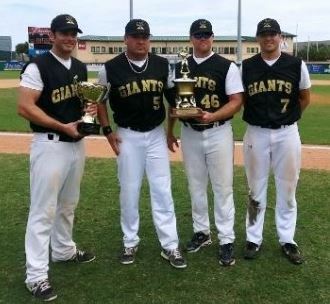 Joe Rodriquez pitched the final two innings to record the save and secure the championship.